Homeland Security Chief: "We Are Safe"
The United States remains safe after the attack at a Scottish airport and two foiled car bombs in London, and no lifting of the terror alert status is planned, Homeland Security Secretary Michael Chertoff said Monday. "We are safe, but we are safe because we continue to pay attention and we continue to add security measures," Chertoff told CBS's The Early Show. The homeland security chief noted that it appears no suicide bombers were involved in the incidents over the past several days in Great Britain and said that sends the message that would-be terrorists have a wide variety of ways to attack. "If you look back at all the plots, you've seen a wide variety of techniques," he said. But Chertoff said authorities in the United States must prepare for a wide variety of threats, even though the suicide attacks often are the most spectacular. He also said the country needs to be especially vigilant about how and under what circumstances the threat increases. "I think we've been saying for some period of time that we need to be looking not only at homegrown terrorism, but that international terrorism might come to the United States through Europe," Chertoff said. The United States' terrorism alert for airports is at orange, the second highest level, and yellow, the midlevel stage of the alert status, for the rest of the country as a whole. Red is the highest alert level. 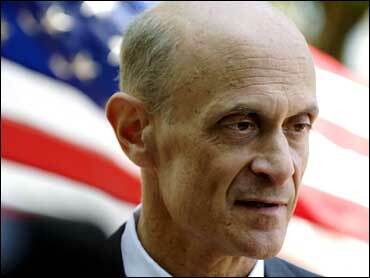 Chertoff said the decision was made to leave the terror alert where it is for now, "based on what we've seen so far." At the nation's airports, security measures have been increased, with more attention paid to vehicles inside the airport and more U.S. Sky Marshals placed aboard international flights, reports CBS News correspondent Randall Pinkston. A U.S. official, who spoke on condition of anonymity while the investigations were ongoing, said Sunday that American authorities were running the names of the suspects in Britain through their databases to look for links to the United States. Those checks would include watch lists such as the no-fly list; any clue that the suspects had shared an address with people in the U.S.; intelligence indicating the suspects made calls into the U.S.; and other similar types of investigative work. It was not immediately clear if counterterrorism agencies had any hits or connections. Appearing Monday morning on ABC's "Good Morning America," Chertoff reiterated that "we do not have any specific credible information about an attack directed against the United States." Chertoff also said that although U.S. authorities have not increased the alert level beyond orange, "we have taken some steps to implement pre-existing plans to increase security at our airports and our mass transit and other transportation centers." "That's partly a reflection of what happened over the last few days," he told ABC. "It's partly a recognition of the fact that during the heavy travel, there will be crowds and we want to be prudent and take some extra precautions. But there is no specific threat that we're aware of at this point." U.S. airports and mass transit systems are tightening security ahead of the Fourth of July holiday and more air marshals will travel on overseas flights. "We will be doing operations at various rail locations and other mass transit locations in cooperation with local authorities. Again, not because of a specific piece of credible threat information, but because we are going into a holiday season. There will be a larger number of people traveling," Chertoff said. From Kennebunkport, Maine, where he is hosting Russian President Vladimir Putin for a visit, President Bush said Sunday that he was grateful for the new British government's "strong response" to terrorist threats in London and Scotland. "It just goes to show the war against these extremists goes on," Mr. Bush said. "You never know where they may try to strike, and I appreciate the very strong response that the Gordon Brown government's given to the attempts by these people."